Maximus Smart Security Light was featured on NewsWatch as part of its monthly Tech Report, which features the latest and coolest technology products available to consumers. Andrew Tropeano, a technology expert and the host of NewsWatch, conducted the review and shared with viewers how this light will keep any home safe. Companies around the globe have taken traditional home appliances like locks, thermostats, and lights and turned them into smart connected devices. Meaning, homeowners can not only access them remotely on their phone, tablet, or computer, but also that they’re more than just lock or a light, they have integrated functions. 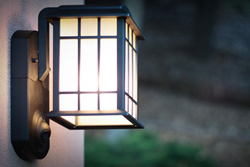 The Maximus Smart Security Light goes beyond being just an aesthetic, decorative light. It's a smart light, which means that the light can be controlled remotely, set on a timer, and be motion-activated. What makes this light unique from other lights is its built-in security system. The built-in HD camera starts recording when it detects motion. Once it detects someone the owner receives a notification on their phone or tablet through their app so they’re always able to keep an eye on their home. They can then interact and talk with the person and determine whether they’re friend or foe. There’s even the option of prerecording a message to play when someone approaches the door. The Maximus comes in four different designs with more coming soon, including a companion light. The Maximus light can be purchased at homedepot.com for $199. To learn more, visit http://www.homedepot.com today. NewsWatch is a weekly 30-minute consumer oriented television show that airs on the Discovery Channel and ION Network. NewsWatch regularly features top technology products and services, mobile applications for iOS, Android, and Windows devices, unique and beautiful travel destinations around the world, health and medical tips, and entertainment interviews on the show. NewsWatch airs on the Discovery Channel at 7:00 – 7:30 AM ET/PT. NewsWatch is located in the greater Washington, DC area and has been on air for over 25 years. For more information or to watch the most recent episode, visit http://newswatchtv.com/tech-report.html.